DollarDays was founded in 2001 by Marc Joseph which is the author of the book "The Secrets of Retailing ... How To Beat Wal-Mart" which is currently being sold on DollarDays, Amazon, Barnes and Noble and other popular online stores. Mr Joseph has also helped build many well know retail stores in America and most recently sold a chain of hair salons in Arizona in order to devote his time to DollarDays. Currently, DollarDays is an online wholesale distributor and closeout company with hundreds of thousands of products to choose from. As for quantities, most items sold on the site require you to purchase in bulk, but unlike with other wholesale distributors, DollarDays doesn't require customers to purchase items in very large quantities; instead, customers can purchase only a case which makes it possible for anyone to buy from them. 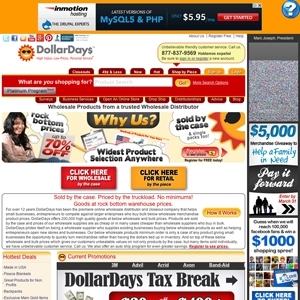 Dollardays.com currently ranks #49 amongst sites offering online deals -- MacMall ranks #48. In the General Merchandise category, DollarDays ranks at #25 -- Sears Outlet ranks #24.